New features include Legendary spells, the Magnetic keyword, Omega cards and Project spells. 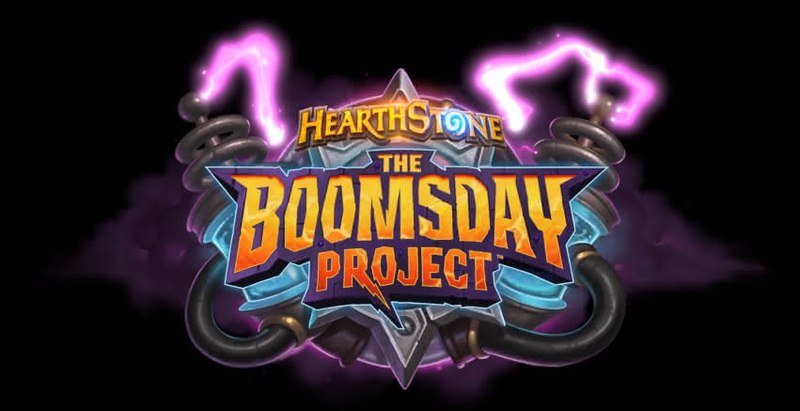 The second expansion of the Year of the Raven was indeed related to Netherstorm, home of the unforgettable Dr. Boom, and it's called the Boomsday Project. Apart from the new features, five cards were also revealed. The announcement video has an appropriate 80s science fiction movie vibe, featuring notable faces from the Hearthstone team. It's Goblins vs Gnomes 2.0 as the Mech tribe is definitely going to return with a vengeance! There's a new keyword called Magnetic: Magnetic minions can either be played on their own or they can be fused with a Mech minion that's on the board to add to their health, attack and ability. Omega cards can also be played regularly. However, if you play them at 10 Mana Crystals, you will get a powerful boost. 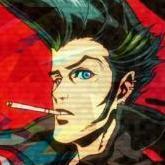 The Battlecry assures that the OP version cannot be cheated out. Druid, the only class that can ramp its Mana up, will surely find a use for this type of minion. Curiously enough, the Omega Defender isn't a Mech, even though it definitely looks like one. Projects are powerful spells, that will benefit both players. Assumedly, all classes will have a Project spell. "Research" and "Weapons" Projects were teased, with the latter probably belonging to Warrior. 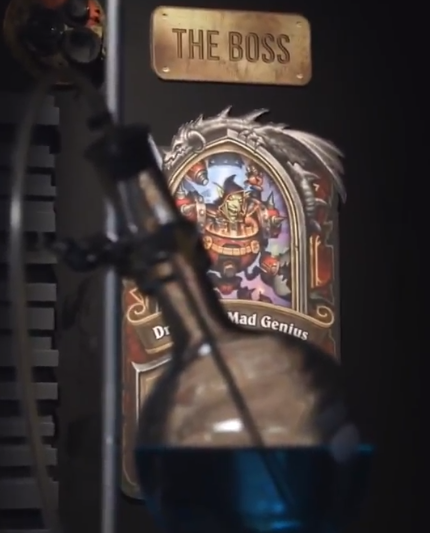 It's almost certain that Dr. Boom will be making a grand return for this Hearthstone Expansion; after all, he's the big boss on The Boomsday Project. 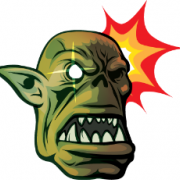 He was shortly teased in the announcement video: unfortunately, this time around not all classes will be able to enjoy the Dr. Boom goodness as he looks like a Warrior card. Lord Jaraxxus will also reinvent himself as a new Warlock Hero skin: Mecha-Jaraxxus! According to the official announcement post, the new expansion will go live on August 7, 2018 - a week earlier than August expansions from previous years. 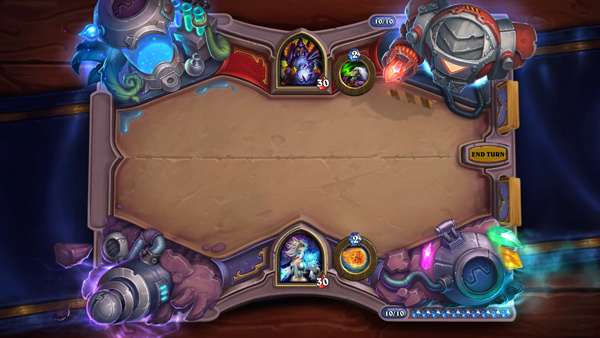 The official site of The Boomsday Project is also up! The login launch reward for The Boomsday Project will be three packs and a random Class Legendary card. A card reveal livestream will be held on July 23 at 10:00 am PST on the official Hearthstone Twitch channel. Pre-ordering The Boomsday Project has some additional perks compared to other expansions and two different options. You can preorder the normal Bundle which will contain 50 The Boomsday Project packs, a random Golden Legendary card from the expansion and the Mecha-Jaraxxus card back. Or you can get the Mega Bundle, which contains 80 packs, a random Golden Legendary, the Mecha-Jaraxxus card back and the Mecha-Jaraxxus Warlock Hero skin. well predictions were about right on the fact that it's the Nether! Was not expecting it to be that Explosive though 😄 ! Okay, this looks interesting, but I find myself questioning a few things. 1. The Magnetic cards. Will they not bring back old school silence decks, like Priest hd going for a while perhaps? It would invalidate the effect, and perhaps make people less enthusiastic about the mechanic. Though it could be good to make some kamikaze cards with the spiderbot, if played correctly. 2. Omega cards. They say it will gain an additional effect once you have 10 mana, though will they still only cost their normal price, or is it something where you need to spend ten mana too? I think the first, but you can never be sure. Regardless , Druids will still love them. 3. What the heck is with that Rogue legendary spell? Is it meant for Kingsbane decks by any chance? A guarantee to get the weapon, as much pump for it as possible, and then just keep redrawing that weapon over and over? Could be a mean combo if you also include the Fal'Dorei Spider I suppose? Gonna be interesting to see what people can do with it. 4. How much are the mega pack actually going to cost? Because having a basically *deluxe pack* makes me think it'll be REALLY expensive. As for Projects, I have no questions. I find them interesting, though unlikely to be played. 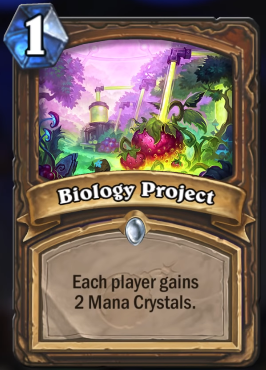 How often do you want to give 2 mana crystals to your opponent for example? 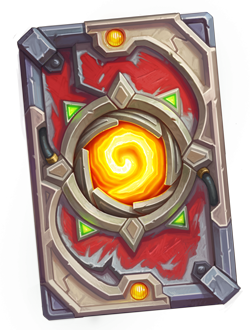 We'll have to see what the other ones are, but it's rare cards that give your opponents benefits are used much. dose the fussing of a magnetic minion to another one triggers their deathrattle (since the minion is destroyed) ? From what I can tell, no. It will add the death rattle effect to the minion you magnetize it with. It will likely be cast like a buff spell. Man i really like the way how Blizzard announces stuff. They are very creative at this point and it feels like they really enjoy the videos with real actors. Well, silence priest wanted to silence its own stuff really. For other decks, playing lots of silence comes at a cost. And you have the option not to fuse the minion and just play it on its own. And like you say, in the case of spiderbot you probably will generally want to fuse it, and kill the resulting minion too. Very powerful effect potentially, if any hunter decks want it. It’ll be interesting to see how it impacts wild too. Should be some pretty powerful wild mech decks available if the cards are even remotely viable for Standard. I am not sure how much I like these cards. Magnetic is super cool, but it is really just conditional charge, but better. Sure it can get wrecked by silence, but that is really strong. Plus spider bomb is pretty okay. As it stands, it might see play in hunter decks, without the magnetize, especially slow ones, possibly a replacement for deadly shot, and will most definitely see play in mech hunter, if such a deck exists. I really like the Omega cards, cards that are, theoretically, good if you play them on curve, yet not dead draws late in the game. 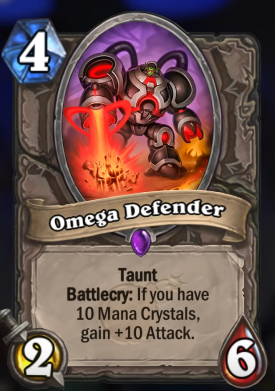 The omega defender seems okay, its kind of like a tar creeper that isn't a dead draw against control, but it is going to be really meta game dependent. a 2/6 for 4 is pretty meh. 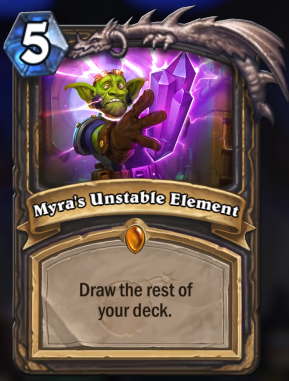 It really depends on the aggressive deck and how impactful 2 attack minions are, if you see a lot of aggro decks that run a ton of 1 or 2 health minions, then this has a shot of seeing play, if the threats they play are more resilient, then this seems a lot less good. I don't like project cards. The entire design of them basically means they are either going to be busted or worthless, and probably zero in between (think cold light oracle). Completely symmetrical effects like this are always worse for the person who plays them because they cost that person mana and a card. Which means in order to "break the synergy" you have to really abuse the effect the card has, which generally means you do something completely degenerate with it. They are, in essence, a type of card that will never see play fairly, and I don't really care for that. As for biology project, meh, druid has better ramp options. An aggro deck may be able to abuse the cheap ramp since they tend to use mana far more efficiently then other deck types, but I doubt it, ramping your opponent into flame strikes is bad. The shaman legendary also seems really strong in aggro decks. As a value card it looks really cool in control or midrange decks, but my intuition tells me that this just won't work out well. It is conditional, and pretty meh if you have to play it without a spell, plus shamans don't have the best spells for that sort of thing. Still might see play in some sort of janky combo deck or along side the spell stone in overload shaman (has some interesting synergies there, especially upping your overlord cost), but as far as a general good card in control oriented lists, probably not. HOWEVER, this card is great in aggro decks. Being able to double up on something as simple as zap is amazing, and it also means lava burst does 10 damage, rock biter + doomhammer is 16 with it. Even lightning bolt is a fire ball. At least it isn't even. I am not excited for this. TL:DR, Not incredibly excited, both legendary cards are silly strong in aggro decks, project cards are either going to be useless or used for degenerate shenanigans, and magnetize will probably just be abused as a conditional charge for aggro decks. What a time to be alive. 51/51 for 10 mana, simple as that. "I still expect something Netherstorm-based...maybe with a lot of Bloodelves, Ethereals and a comeback of Dr. Boom (but hopefully not). I can also imagine some sort of legendary spells for each class." 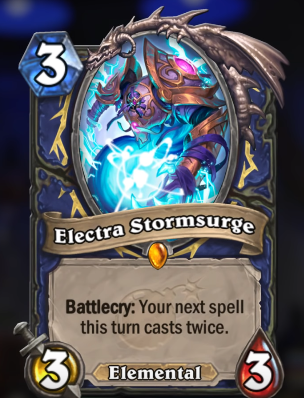 Anyways...Electra Stormsurge seems extremely strong. For only three mana it can easily combo with a lot of spells (Bloodlust *cough cough*) and even if it turns out to be not powerful enough with current spells, there is a huge potential with upcoming ones...not to mention the legendary spells. Love the idea of Omega-Defender in decks that are obviously druid, but shouldn't it have a 'Mech' tag? 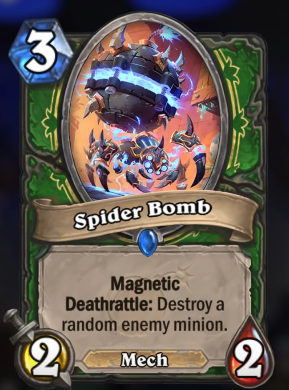 I have a question: How does the spider bomb work if the opponent has an explosive runes secret? I assume its deathrattle will trigger and kill something if the opponent has minions. The minion is already in play when explosive runes hits, so it should all work.